Cellophane Bags Size:" 4x6 ". 200 cellophane bags with 200 twist ties in a re-sealable bag. and any non-food things. Use these traet bags to showcase edibles and treats in restaurants. The suyncyi treat bags with Ties are the accessories you need. Ideal for gift bags or party bags to fill with sweets. Use for cookies, cakes, biscuits or chocolates. Also note that monitor settings may vary from computer to computer and may distort actual colors. Wholesale Gift Bags. Material: Plastic. Note: Due to the difference between different monitors, the picture may not reflect the actual color of the item. 3 Vintage New Old Stock Holiday Heart Christmas Doves Reindeer Large Gift Bag. Condition is New. Shipped with USPS First Class Package. High quality in EU and US quality standard Material:velvet Size : 10cm*12cm conversion : 1 inch = 25.4mm or 1mm =0.0393inch Quantity: 10 pcs Color:green. 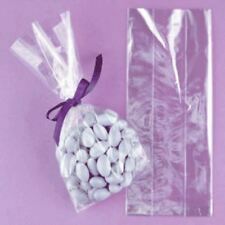 These self-sealing opp bags are ideal for handmade cookies, candy, bakery or small gift and jewelry. 100 x Cookie Candy Treat Bags(other accessories demo in the picture is not included.). These have the self adhesive strip on the lip of the bag. Color: Royalblue. Material: Velvet. New Arrivals. Quantity: You will get10 PCs of this item at the list price. (parcel which under120g ) ——————. 100pcs Christmas Cookies Bags. Self adhesive bags perfect for Christmas parties and celebrations. You can also use it as XMAS party favor bags, gift bags. Occasion: Christmas & Party. Type: Event & Party Supplies. The perfect boxes for your Christmas gifts. NEW - 12 Christmas Boxes. Clear Cello Bags with this colorful printed design are made from 1.2 mil polypropylene. Adorable "Santa's Treats" print design is on crystal clear (see through), high quality, cellophane. 20 Bags - Made In The USA. CELLO BAGS MADE IN THE USA! Christmas Carol print on clear cello. Clear Cello Bags with this colorful printed design are made from 1.2 mil polypropylene. LOT OF 25 BAGS. CELLO BAGS MADE IN THE USA! Clear Cello Bags with this colorful printed design are made from 1.2 mil polypropylene. LOT OF 20 BAGS. Rockin" Trees Cell Bags feature contemporary Christmas trees with musical notes scattered about for lots of musical fun. CELLO BAGS MADE IN THE USA! Clear Cello Bags with this colorful printed design are made from 1.2 mil polypropylene. 25 Cub size: (8x4-3/4x10-1/4"). Tissue not included. These bags have natural colored paper twist handles. Star Wars design. Paper Gift Bags. Lot of 4 Hallmark Christmas gift bags. Gently used. All have cardboard bottoms. All have corded handles. Santa bag 10 1/2 x 8 1/2 x 4 1/2". I would call this a large bag. Nice bright red with a good looking Santa. Cub (8-1/4" x 4-1/4" x 10-3/4"). These bags have white paper twist handles. Includes 7 Bags Total -. Winter White Snowflakes Cello Bags feature beautiful white snowflakes print design on clear cello. Clear Cello Bags with colorful printed designs are made from 1.2 mil polypropylene. Must use a web browser to check out.